A federal appeals court on Friday removed a temporary ban on domestic horse slaughter in the three states. A federal appeals court on Friday removed a temporary ban on domestic horse slaughter. This clears the way for companies in New Mexico, Missouri, and Iowa to kill horses domestically for meat exports while an appeal of a lawsuit by animal protection groups proceeds, reports the Associated Press. In November, the 10th U.S. Circuit Court of Appeals in Denver shuttered several meat processing facilities after animal rights groups caused a commotion. But the Friday, Dec. 13 appeals court ruling said the “groups failed to meet their burden for an injunction pending appeal.” And the judge said the U.S. Department of Agriculture followed proper procedure in issuing permits to Valley Meat Co. in Roswell, NM, Rains Natural Meats of Gallatin, MO, and Responsible Transportation in Sigourney, Iowa. These plants would become the first horse slaughterhouses to operate in the U.S. since Congress effectively banned horse slaughter by eliminating funding for inspections at the plants. Congress restored that funding in 2011, but the USDA did not approve the first permits for horse slaughterhouses until this summer. In Japan, horse meat is a delicacy called basashi. In New York, one Queens diner faced opposition after it planned to put horse meat tartare on the menu. In the West, the AP reports, there is a high overpopulation of domestic horses which leads to their suffering and starvation. 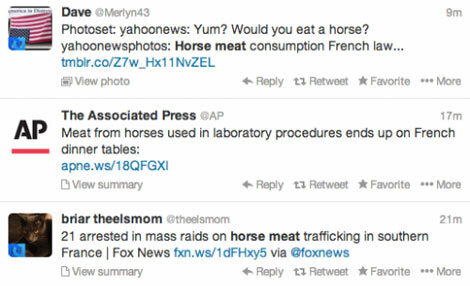 Many U.S. companies would aim to ship the horse meat overseas to be consumed by humans or used as animal feed. Could horse be the future of food? Let us know what you think in the comments.